March 22 is World Water Day. 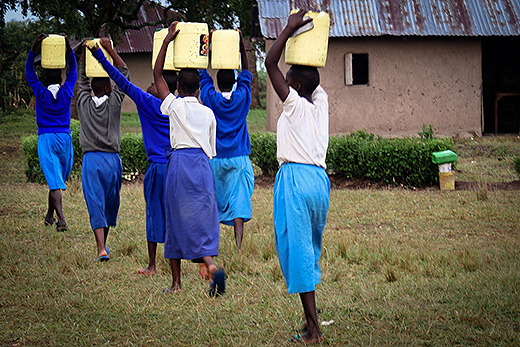 As we focus on the power of safe water to transform people's lives, we must recognize that the burden of providing water falls disproportionately to women and girls, such as these women carrying water in rural Kenya. Photo provided by Bethany Caruso. Imagine going through your day without ready access to clean water for drinking, cooking, washing or bathing. Around the world, 663 million people face that challenge every day. They get their water from sources that are considered unsafe because they are vulnerable to contamination, such as rivers, streams, ponds and unprotected wells. And the task of providing water for households falls disproportionately to women and girls. First, collecting water takes time. Simply to get water for drinking, bathing, cooking and other household needs, millions of women and girls spend hours every day traveling to water sources, waiting in line and carrying heavy loads — often several times a day. In a study of 25 countries in sub-Saharan Africa, UNICEF estimated that women there spent 16 million hours collecting water each day. Collecting water also requires tremendous physical exertion. Water is heavy. The United Nations recommends 20-50 liters of water per person per day for drinking, cooking and washing. That amounts to hauling between 44 and 110 pounds of water daily for use by each household member. And in many places, water sources are far from homes. In Asia and Africa, women walk an average of 6 kilometers (3.7 miles) per day collecting water. Carrying such loads over long distances can result in strained backs, shoulders and necks, and other injuries if women have to walk over uneven and steep terrain or on busy roads. The burden is even heavier for women who are pregnant or are also carrying small children. Tube well water quality is not good… water is saline. Cooking is not good due to this water. Not good for drinking either. People are getting water from that neighboring village…. for cooking we get water from the river. Now imagine that you have managed to get water, but only a limited supply. How will you allocate it? Women need water for hydration, regular hand-washing, washing their bodies, and cleaning clothes and materials when they are menstruating in order to prevent urogenital infection. But in areas where water is scarce, women and girls may sacrifice so that other family members can use water. In a study that assessed how water insecurity affected rural women in Ethiopia, 27.8 percent of women surveyed reduced the amount of water they used for bathing, 12.7 percent went to bed thirsty and 3.7 percent went an entire day without drinking water. One woman described many challenges, including the possibility that no water would be available when she finally reached a source; the struggle to complete domestic tasks, such as washing clothes and cooking, in the time she had left after fetching water; and worries that not completing this work would lead to arguments with family members. Bethany Caruso is a postdoctoral (FIRST) fellow in the Department of Environmental Health at Emory University. This article first appeared in The Conversation.